I have a copy of Tales from the Yawning Portal. On the front cover is a collage of characters who appear in the adventures within. However, there is an odd one out. Inside the front cover it tells you which character is which. Just above Durnan's elbow (man in the foreground) on the left is an elf, which the book identifies as Mialee from the adventure Sunless Citadel. However, Mialee definitely does not appear in that adventure, or at least not in the version of the adventure published in Tales from the Yawning Portal. I have not played earlier editions of D&D, but a Google search indicates that Mialee was one of the iconic characters in some of the earlier editions. 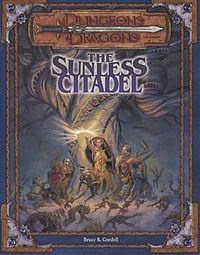 I know that Sunless Citadel appeared in earlier editions of the game, so there is the possibility that Mialee appears in the earlier version, but I do not know. There is a sizeable cast of characters who do appear in the adventure who could have appeared on the cover instead. Yet for whatever reason the artists chose Mialee. The Sunless Citadel was originally a 3rd edition module - all of the adventures in Yawning Portal are updates of earlier editions. The woman in the middle? That's Mialee. Not the answer you're looking for? 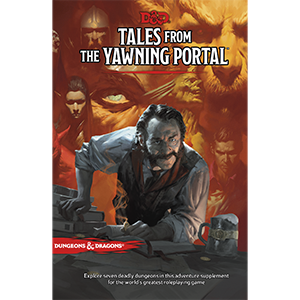 Browse other questions tagged dungeons-and-dragons lore tales-from-the-yawning-portal or ask your own question. What did you do for a Tarrasque adventure? How does crossing the borders of Ravenloft's domains work? Is there an Aberration with a Negative Energy Breath Weapon at all in the lore? Who is that demon on the cover? How many hours of gameplay for Tales of the Yawning Portal?